A French company that has developed and launched driverless electric shuttle buses in 20 countries will next week trial their driverless electric mini-bus at Springfield near Ipswich. This follows trials along the Esplanade at Mooloolaba in December 2017 and their introduction at big business sites in California and Singapore in 2015. They have also been trialled in Canberra and Darwin. Overseas, the fully electric vehicles are used on airports and on large commercial sites to shift employees around the work sites. Each shuttle costs about $320,000 but can carry 12 people – six seated, six standing – up to 45km/h. They have no steering wheel and use sensors on each corner to “read” the roadway, objects in front, back or beside the vehicle. 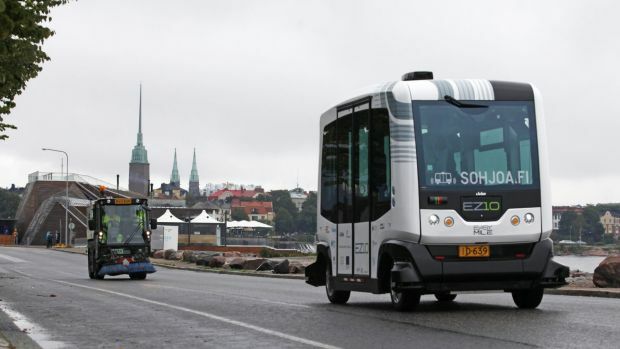 The company is called EasyMile, which was put together in 2014 and now has launched driverless shuttle buses in the Asia-Paciﬁc region, the Middle East, North America and Europe. The same model – the EasyMile’s EZ10 electric shuttle – is coming to Ipswich. Ipswich City Council is trialling one of the driverless shuttle buses around its Orion water theme park lagoon near the Orion Shopping Centre on John Nugent Drive at Springfield next week from Monday. EasyMile spokesman Simon Pearce said anybody could ride the shuttle during the public demonstration times next week. “The loop along John Nugent Way takes about five minutes, so it’s a great way to get a taste for what the future of public transport might be like,” Mr Pearce said. Mr Pearce previously told News Corp the driverless shuttles used sensors to detect things around the vehicle. “It operates completely autonomously, so no steering wheel, no driver’s seat, no accelerator, no brake,” Mr Pearce said. Their website says the company hopes to provide “a powerful in-house ﬂeet management solution for autonomous vehicles”. Ipswich’s mayor Andrew Antoniolli said the city was interested in electric vehicles and had begun to install electric vehicle chargers on several of its light poles. In September 2017, Ipswich City Council and the state government announced plans to recruit 500 motorists for a trial where their cars are fitted with technology allowing them adjust to information from road signs, or new road safety warnings, or queues. “For example, a pedestrian crossing at a signalised intersection, a red light runner or a queue ahead,” Main Roads Minister Mark Bailey said in September 2017.